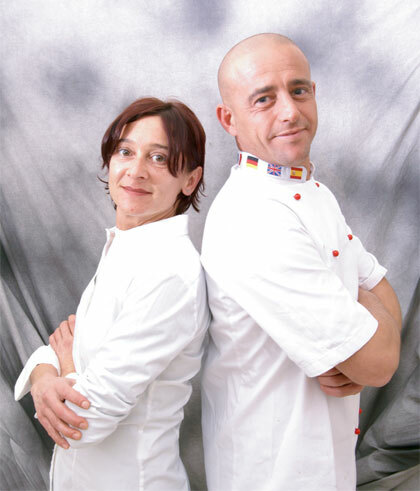 Owners Ilaria Bigazzi and Leonardo Rettori are an extremely warm couple, both at work at in their private lives, with extended experience in hospitality. After gaining experience at large restaurants in Florence and abroad, they decided to start their own business. Since 2008 they have owned ENJOYTOSCANO, a popular restaurant and wine bar in the central piazza of the splendid village of Castelfranco di Sopra. They also run a business providing personal chef services under the brand “NONSOLORISTORANTE” for intimate dinners or small events, and provide catering and banquet services for ceremonies and large events with ENJOYTOSCANO CATERING. They are supported by a staff of professional cooks and a young dynamic dining room and bar staff. They have long-standing partnerships with important event planners, agritourism establishments and prestigious locations, and with wedding planners, photographers and musicians. They are able to meet any need: from small to large events. They are always available for a meeting free of charge, to listen to your needs and recommend the best solutions. "We hired ENJOYTOSCANO for our wedding banquet. It was an extraordinary day, and the exceptional service made one of the most important days of our lives worry-free. " "We had heard good things about ENJOYTOSCANO from friends, so we contacted them to cater our wedding. We wanted an intimate event in the garden at our house. We had an excellent experience. They are great people, the cooking is top-notch and the staff is attentive and polite. We are pleased to recommend them." "+We are Japanese and for our wedding we wanted typical Tuscan cuisine, but also wanted to be able to offer traditional Japanese food for the children. They have an expert sushi chef who prepared an alternative menu. This was the ideal solution.+"
"I wanted to have a special party with friends and family to celebrate my fiftieth birthday. ENJOYTOSCANO created a lively and fun atmosphere for me, accompanied by good food, a fantastic cocktail bar and a DJ set that entertained us all night long. And everything came at an absolutely accessible price. Highly recommended."